You might remember the introduction of my Ravenwood Messenger Bag Pattern last February as part of the Bag of the Month Club. Now that the club has ended the pattern is available for purchase in my shop! My son has been carrying this bag for months and loves it! 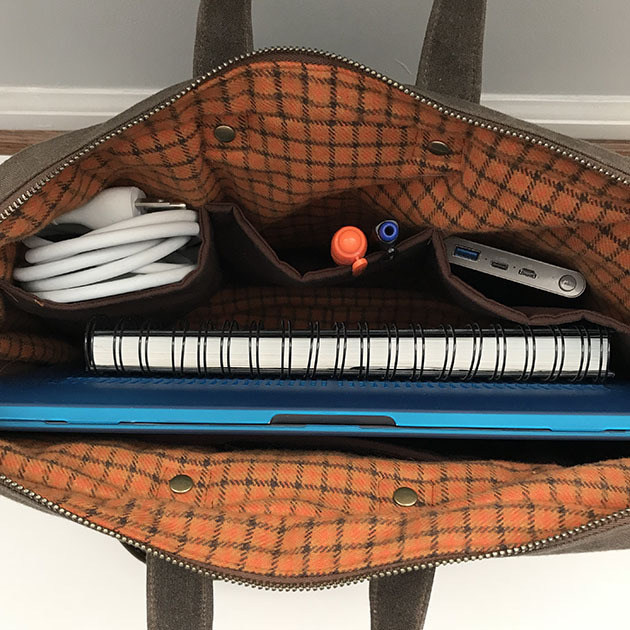 He uses it for his laptop as well as other tech gear, a sketchbook, papers, and more. The waxed canvas is holding up really well and just gets better with age! 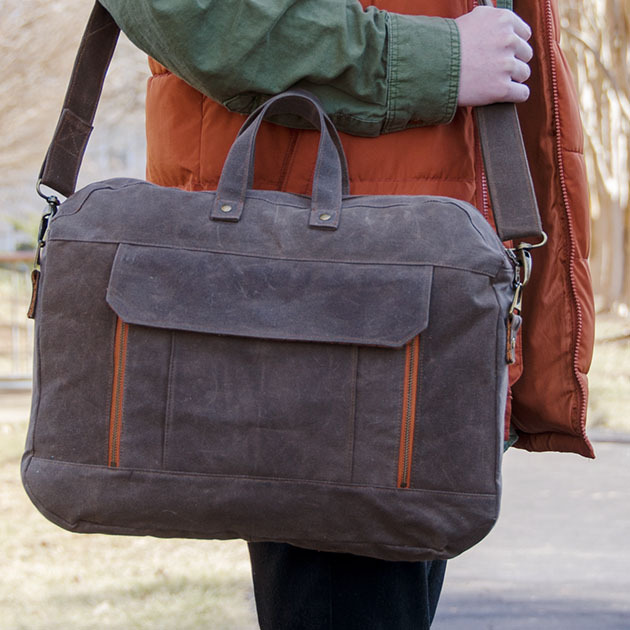 The Ravenwood is utilitarian with multiple pockets inside and out, plus room for a 15” laptop and daily necessities. 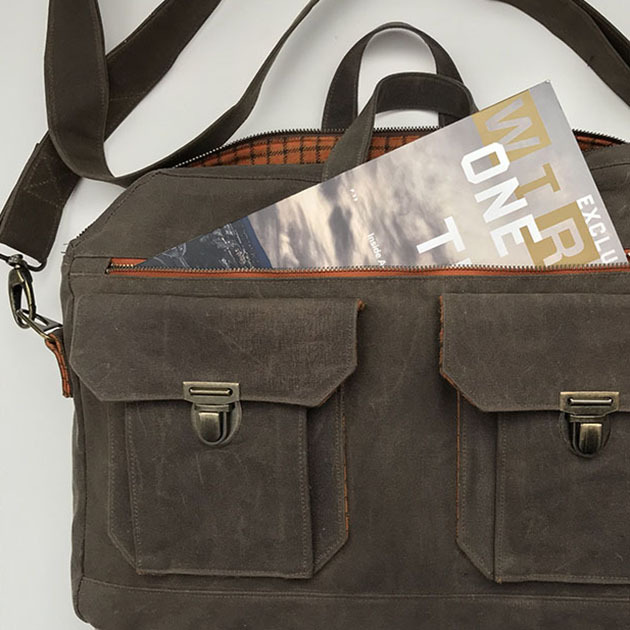 The front has 2 roomy pleated cargo pockets with tuck catch closures as well as a large zippered pocket for a magazine or notebook. 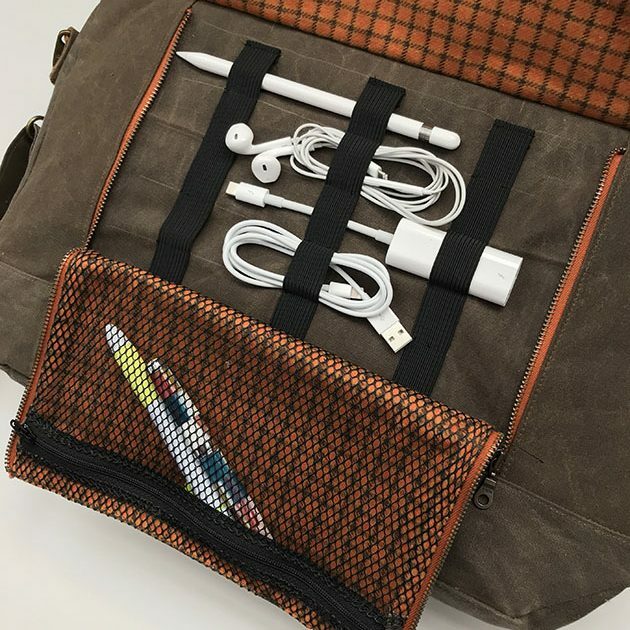 The back exterior has a double-zip tech pocket that holds cables, cords and earbuds, keeping them organized with elastic straps. There’s also a zippered mesh pocket for smaller items. Inside there’s a padded slip pocket for a tablet or small laptop. A 15” laptop fits easily into the main compartment. There’s also 3 divided pockets for glasses, pens, chargers etc. If you’re interested in sewing with waxed canvas but never have, you can read a little more about it in this post. If you don’t want to use waxed canvas, no worries. Regular canvas or home dec weight fabrics are great alternatives. You can search the hashtag #ravenwoodmessengerbag on Instagram to see dozens of bags people have made in all sorts of fabrics. I would definitely rate this pattern as an Intermediate skill level. It’s an ambitious project! None of the steps are particularly difficult, but it does take some time and patience to sew. 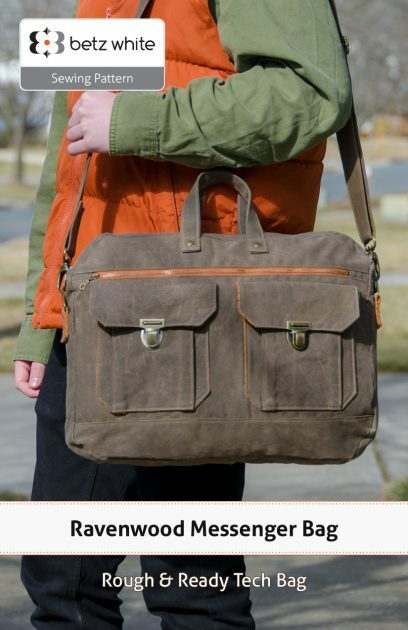 The Ravenwood is a great bag to sew for men and women! Fun fact: The bag gets it’s name from Marion Ravenwood, a character from the Indiana Jones movie! Marion was Indy’s girlfriend and the daughter of Professor Ravenwood! :) The pattern is now available as a PDF in my shop if you’d like to give it a go!